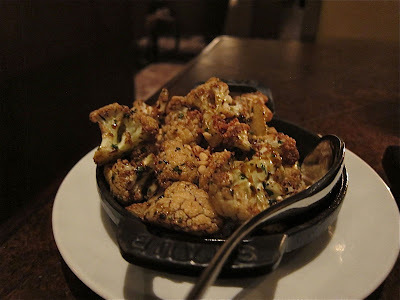 Michael Mina celebrated 20 years of cooking in San Francisco just a few months back. Through these years Mina has set up a culinary empire that spans the country. But San Francisco is still special, for it was here he first began his meteoric rise. A couple of years back, he moved his eponymous restaurant to the same location where Aqua once existed, and where he began his climb to stardom. I was in San Francisco for a big industry conference. As usual, there were several dinner meetings scheduled during the week; it was just my luck that two of them (in a row!) 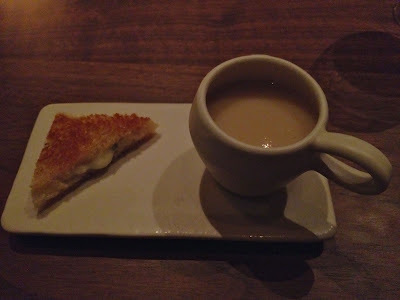 turned out to be at Michael Mina restaurants. 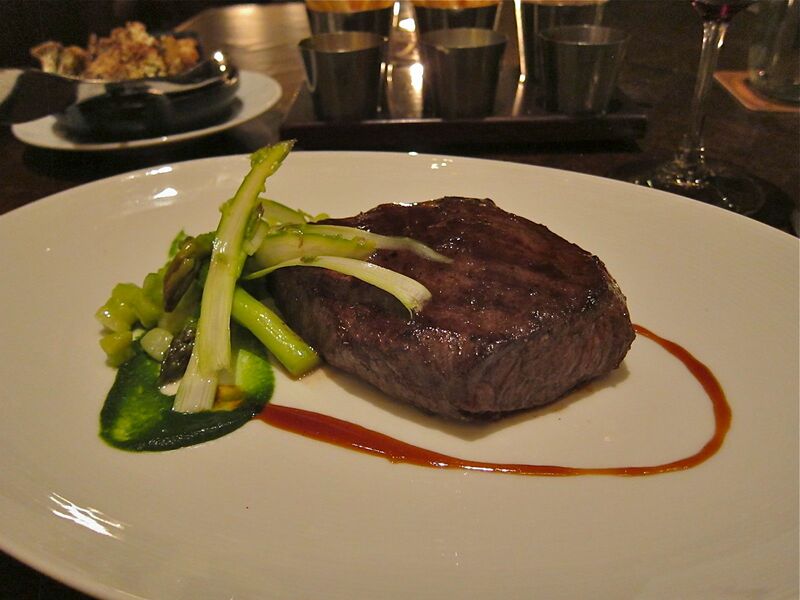 The first was Bourbon Steak within the historic St. Francis Hotel on Union Square. The interiors were still the way I remember it from a couple of years back. The menu was new. 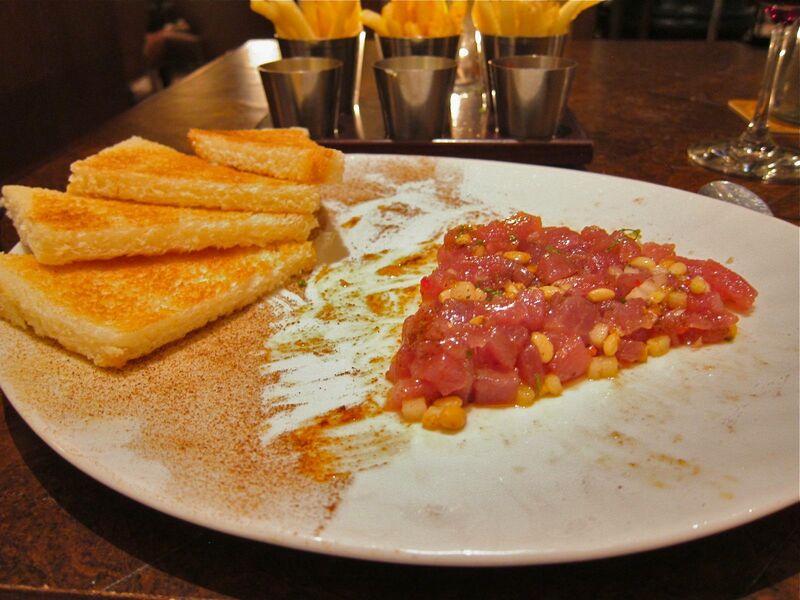 I ordered an Ahi Tuna Tartare followed by the 10 oz Wagyu Flat Iron. 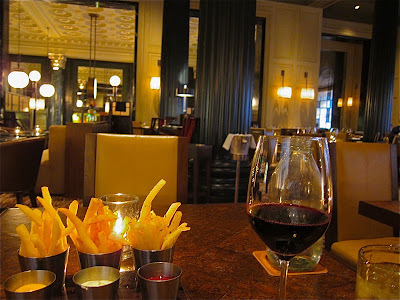 As I sipped on a glass of Pinot Noir, the waitress brought me their famous Trio of Fries. Fried in duck fat, each of them had been seasoned differently and there were three dips to go with them. The Tuna Tartare was served with scotch bonnet peppers, pine nuts, mint and sesame oil. The waitress expertly mixed these ingredients at the table. The result was actually very good! The steak was fantastic: juicy and cooked just right with a side of roasted cauliflower that had been tossed with a garlic-cashew 'crunch'. 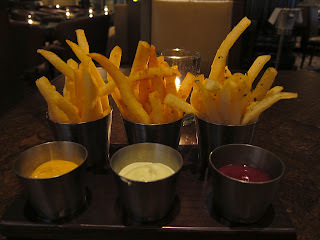 They made my dinner even more satisfying by adding another (complimentary) side of lightly fried asparagus in meyer lemon sauce. The next day we were at Michael Mina's on California Street. They started us off an amuse bouche of hot soup with cheese toast. 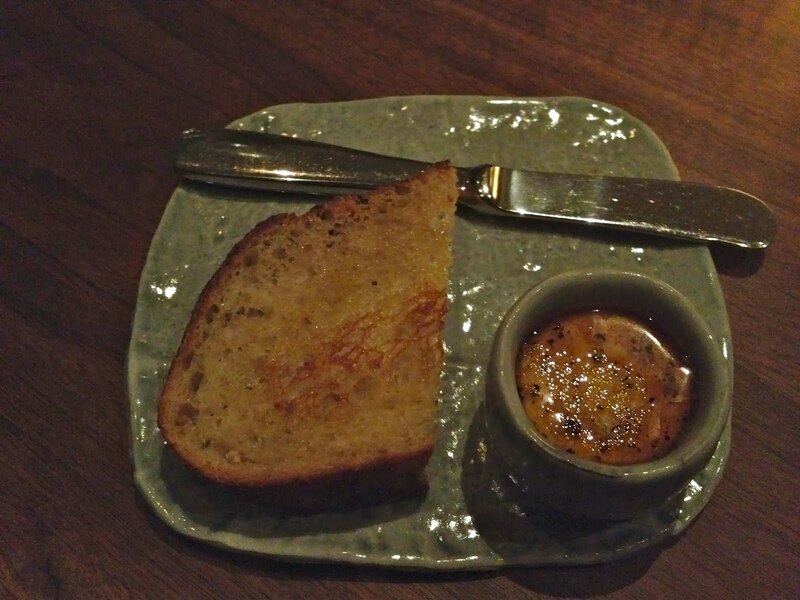 The bread came with an interesting dip of ricotta and honey. 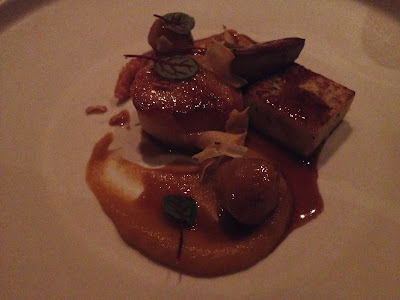 My starter was a seared day boat scallop and foie gras with persimmon, sun choke, red ribbon sorrel. Good stuff! Foie gras is on its way to being outlawed in California which is a pity. We shared a portion of Carnaroli Risotto with oyster mushrooms, Maine lobster, lemon and parsley puree. 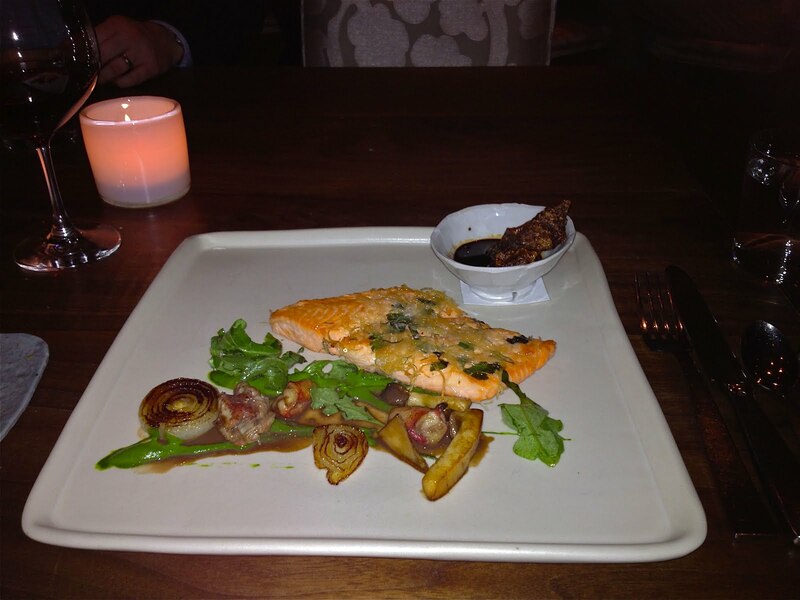 Loved this dish too! My entree was Steelhead Trout covered with a layer of kataifi - a Middle Eastern variety of very fine vermicelli, arugula puree, and a lobster-mushroom royale. 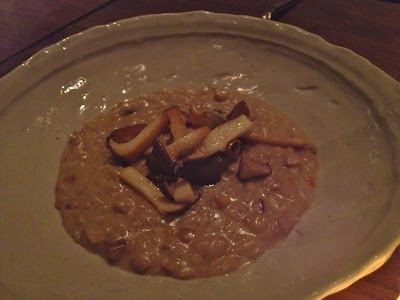 The dish was an interesting medley of flavors and textures but not particularly the highlight of this meal. This was another good experience made better by being in the company of several colleagues from around the world. Next time though, I will pick the Duck or the Venison entree! Overall, I must say Michael Mina restaurants are expensive but they consistently deliver.